A mashup is a derivative work consisting of blending two or more media sources. For example, a live train map for the London Underground, a remix of songs, or a calendar add-on showing the due dates on your library books. The first Mashed Libraries event took place at Birkbeck College in November 2008. Since then, there have been events at Huddersfield (Mash Oop North! ), Birmingham (Middlemash) and Liverpool (Liver and Mash). Since the theme of this event was RFID, the name Chips and Mash emerged. The next mashed libraries meet will be in Bath on 29th October, and the name Mash Spa has already been suggested. Librarians deal with a huge amount of data, and the Mashed Library events provide a context for bringing together librarians and technical people to find new ways of ‘mashing’ library data into new and wonderful forms. The word ‘shambrarian’ was often heard at Chips and Mash! A shambrarian is someone who works in a library or information management context (often in a tech/IT role), who knows a lot of librarians and may share some of their characteristics but is not a librarian themselves. Librarians often have ideas for mashups they would like to create, and they need the shambrarians’ tech skills to make them happen. Many people now have smartphones, and you can download a free QR reader app for your device. When you scan the QR code with your phone, it will link you to directly to some text, a URL or a phone number. This QR code will direct you to my Twitter profile. Some libraries are now displaying QR codes at strategic points to help with user education. for example, a QR code by the photocopier might link the user to a tutorial about how to do double-sided copies, or QR codes on print journals might link directly to the electronic version of the same title. I like the way that exploring the library using information linked from QR codes could make the process seem like a treasure hunt or an adventure, rather than a chore. Generating a QR code is free. Search for ‘QR code generator’ and you will find a variety of sites for creating your code. You can then save the image as a file, or copy and paste the HTML to embed the image on a web page. Intellident sponsored Chips and Mash and they brought along some RFID products to demo. I was excited to see the same type of self-service kiosk that will be arriving in my library in two weeks’ time! John Cunningham did a presentation about the range of applications they have for RFID, including monitoring the supply chain stages of fresh fruit and vegetables for supermarkets and movement of clothing stock for Marks and Spencer (look out for ‘intelligent labels for stock control’). Linda Davies described to us the Intellident smartBlade installation at her workplace, Cardiff University. It involves placing thin panels at intervals all along the bookshelves. Using the related software, you can search for a book, and the system will send a pulse out to all the panels, reading all the books’ RFID tags until it finds the book you have searched for. A small blue light then flashes on the panel closest to the book. There were many impressed faces in the audience but I think very fee of us will ever see this in our libraries. As for me, I’m content with having RFID at all, and the installation of the system in my library this summer is very exciting. We were asked to bring our own name badges for this event, and undercurrents of creativity and competitiveness blossomed into a competition for who had the best badge. 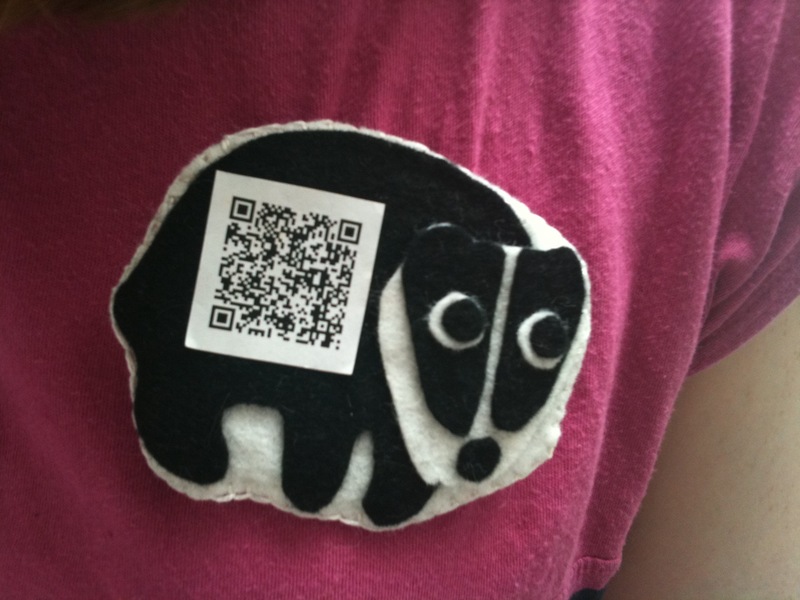 This was further complicated by the ‘badger’ theme – a Mashed Libraries tradition harking back to some meeting notes in which ‘badge’ had been misspelled – and now it seems that badgers are the official mascot of the mashup events. I took pictures of as many badges as I could and you can see my photos in this Flickr set. 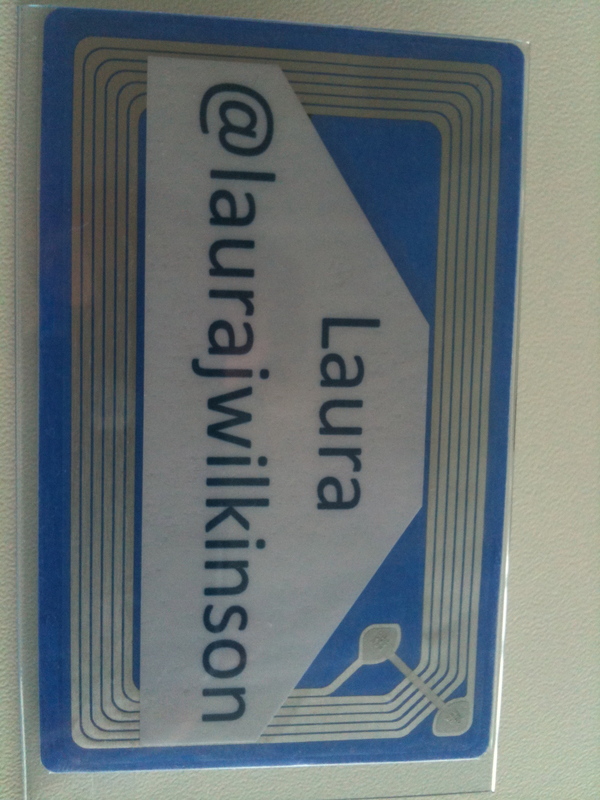 I won a prize for my badge, made out of an RFID tag! If the book is on the shelf, you can scan the QR code which gives you the book details (e.g. author, title, shelf mark). It’s very useful, I think. Lizz, do people use the QR codes on the catalogue? Was user usage of QR codes and similar discussed at #mashlib? I’m a bit of a sceptical, non-techie type – I can see that they have lots of potential, but find it hard to imagine readers using them in our library. Would like to be proven wrong!